Luxury Southern charm at its finest! 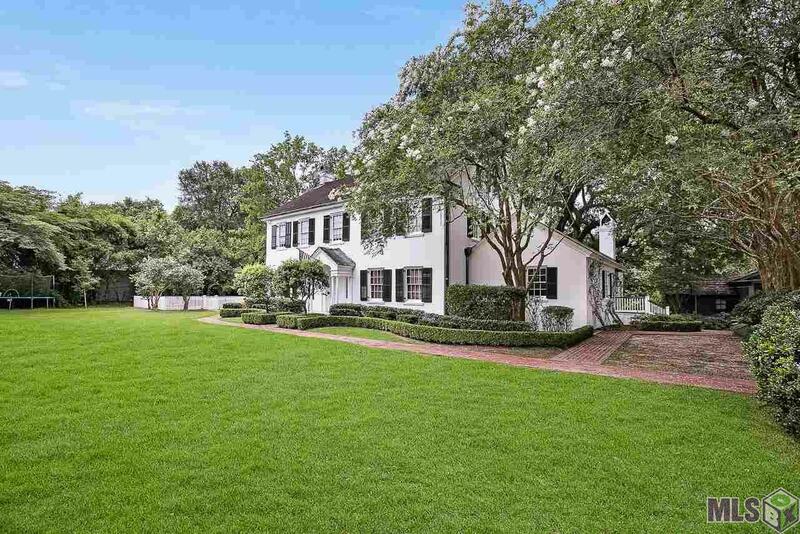 This stately Georgian estate features a renovated kitchen and keeping room by A. Hays Town, sits on 3+ rolling acres and is just steps away from the LSU Lakes. This home has all the ambience of a historic plantation home with its terracotta roof, original wood floors, grand staircase, marble throughout, and arched wood windows overlooking a truly Southern back porch. Enjoy luxury entertaining in the chefâs kitchen featuring an oversized island, walnut cabinetry, large capacity built in refrigerator, gas cooktop, double oven, warming drawer, butlerâs pantry, wet bar and wine room. All open to the quaint keeping room with masonry fireplace, cypress beams and backyard views of the majestic Oak. Retreat to the master suite that offers renovated master bath with such modern luxuries as a wet bar, wine cooler, walk in closet, marble countertops, large soaking tub and separate marble shower. The third floor has two large bedrooms with an abundance of built ins and storage spaces. This home has recently undergone many updates including fresh interior paint in its entirety, all wood floors refinished, all new ceiling fans, new dishwasher & disposal, electrical wiring to include all new switches and outlets, all new plumbing fixtures and plumbing work, new water heaters, and new kitchen roof. Other features of the home and property include a study adorned with a walnut coffered ceiling, large china closet in the dining room, sun room, lots of closets, mature landscaping, herb garden, private pond with bridge, plenty of parking and a 1,491 square foot guest house full of potential. Schedule a private showing today for this one of a kind Highland Rd estate! Exterior: Balcony, Guest House, Landscaped, Porch, Storage Shed/Bldg.